Recently Commission Vice-Chair David Cutler wrote about the way the proximity of residents and workers factors into making neighborhood business districts more dynamic. He pointed out there are complex factors at play in neighborhood retail districts, not the least of which include demographics, disposable income levels, and other market determinants. In this week’s Dispatch, we continue to explore the key ingredients to creating thriving, pleasant neighborhood business districts. Seattle residents have a strong identification with their local neighborhood business district—each unique, giving a distinct flavor and ambiance to the community. Indeed, it’s one of the things that makes Seattle special. 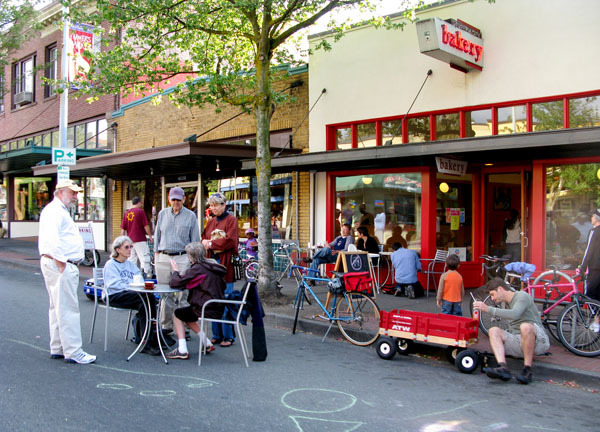 When speaking of Columbia City, the West Seattle Junction, Pike/Pine, Greenwood, or any of the other 30-plus neighborhoods in the city, one immediately grasps a picture of the types and mix of businesses, the community treasures (be it a park or art work or farmers market), and the accessibility of each. Do our business districts have special needs that can be addressed as Seattle’s Comprehensive Plan is updated? Indeed, Seattle expects to welcome at least 120,000 new residents and 115,000 new jobs by 2031, and the expected growth in population and jobs will provide growth opportunities for existing neighborhood business districts by infusing them with new customers and creating neighborhood-area jobs. But, other than a critical mass of people living and working within close proximity to the district, what else do our neighborhood business districts need to be successful? Leading and implementing neighborhood revitalization requires organizational capacity. It includes recruitment of volunteers and the development of community leadership from among property and business owners and area residents. Creating community ownership of public spaces is essential to creating a cared-for neighborhood business district. Additionally, this type of attention requires a sustained and ongoing commitment in the form of local business, community, and civic organizations that attend to the ongoing stewardship of the district. Business organization can also play an essential role in helping to recruit and attract new businesses through marketing and other efforts. Neighborhood plans lay the groundwork for new investment in the community, but the City often waits for some action to come along which may not happen for years, leading to community frustration. It sometimes feels like the City doesn’t have a coherent way of dealing with investment to implement the plans that are developed with the neighborhoods. Coming up with strategies that align resources as public/private partnerships can direct new growth and development in ways that contribute to the vibrancy of the neighborhood. The city’s office of Economic Development offers technical assistance to business districts including information about resources and partnerships. A unique image helps local residents identify with their neighborhood and attracts outside visitors. Identifying what is unique about a community can create an identity around existing assets. Fremont does this with its funky art, Ballard has Scandinavian flags and shops, and the University District emphasizes its connection to the University of Washington. 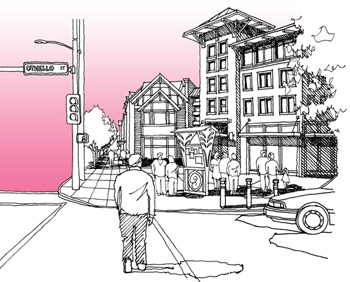 In Othello the city is working with ethnic business to develop a retail district with an international focus understanding that the communities’ plethora of culturally specific businesses is a unique and valuable asset. The focus of this effort involves supporting the established multicultural business district at Othello light rail station by providing technical support and innovative approaches to stabilizing commercial leases and growing local businesses. Many communities hold farmers markets, summer music festivals, parades, or holiday fairs. 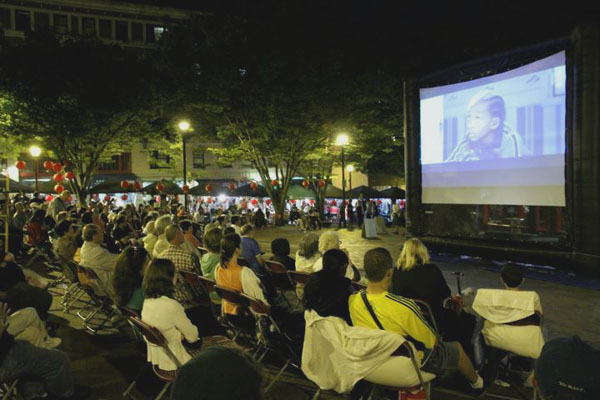 Well-organized events can help create or reinforce a community’s “brand.” Open spaces such as plazas and parks in a business district not only provide necessary places of respite within high density, but also act as the community’s formal and informal gathering places for neighbors to meet, share ideas and gossip, hold special events and festivals, and celebrate occasions. These spaces need access to water and electricity so festival vendors can operate. They also need to be programmed and activated so they are welcoming and lively spaces and not places for illicit activities that detract from the district’s quality. Our city benefits from reduced crime levels; our citizens are safe from most serious crimes. But that fact does not translate to a perception of safety in all neighborhoods. Traffic whizzing by, trees and shrubs overhanging sidewalks and blocking views, poor street lighting and sidewalk maintenance, vacant lots, unattractive and poorly maintained store fronts and more contribute to an environment in which pedestrians feel concerned for their safety, thereby reducing time spent in the district. Crime Prevention Through Environmental Design (CPTED) and other design and planning efforts can play an important role in making sure there are “eyes on the street” and creating a safe and comfortable environment for all. In some areas of town, persistent drug dealing and a lack of positive public activity can contribute to a perceived loss of personal safety and to the demise of signature businesses. Hot-spot policing and ongoing beat patrols have had very positive impact to combating street disorder including reducing drug dealing and property crime. It also creates a stronger perception of community safety by having a public safety presence. A clean business district creates an inviting shopping environment, influences perceptions of safety, and demonstrates an investment in the district’s surroundings. Not all solutions require legislation or government regulation. How often do you see a small business owner pushing a broom to sweep the sidewalk in front of her store? Do dog owners pick up their pets’ deposits after their stroll through the neighborhood? In Pasadena alleys, dumpsters are centralized behind screens in “garages” so that the alleys are clean and fragrance free, and create inviting pedestrian walkways enhanced with public art. In 2009, Seattle adopted its Clear Alley Project in downtown neighborhoods to reduce waste containers in the public right-of–way. The goals of the program are to create cleaner, safer business districts; reduce uncivil behaviors and illegal activities in alleys; increase the attractiveness of alleys for pedestrian use; and allow better alley access for business services such as deliveries. Other Business Improvement Areas work with private companies to handle ongoing and daily streetscape maintenance like street cleaning, pressure washing, and graffiti removal. In many districts, a Business Improvement Area, funded by local businesses, is responsible for this important function. Kay Knapton has served on the Seattle Planning Commission for six years, bringing an economic development perspective to the deliberations, encouraging small business growth and neighborhood business district development. Kay was coordinator for Mayor Royer’s Small Business Task Force, a Seattle neighborhood business district specialist, director of the West Seattle Junction Association (Business Improvement Area). Thank you Kay! Very informative and understandable piece. I appreciate the commitment and leadership you have dedicated to making our neighborhood commercial districts even better. A recent very short tome that addresses the dynamics of urban centers and what makes them work is “Urban Code – 100Lessons for Understanding the City” (Mikoleit and Purckhauer). It would be useful at some level for an analysis of what neighborhoods are working in Seattle and which are not. I would not be surprised to find that there is little correlation between the essays points and success/fail markers. I would have liked to have seen in this last go around of budgeting and department consolidation the consideration of merging OED and DON. I believe this would help us more aggressively address our failing ‘hoods as well as spur growth in other places than just our wealthier and investment-rich neighborhoods.